Read exciting updates from Blood:Water! I would like to be the first person to welcome you to The Year of Living Generously. Some of you got a head start. You stepped into 2018 with gratitude overflowing and a panoramic view of the abundant wealth of community, friendship, finance, and opportunity surrounding us. From that point of view, you have already begun to live with open hands, and I know that this year will be full of fantastical stories. Love will show up where once there was only fear. Hope will be born out of profoundly desolate circumstances. Clean water will come forth from the driest of places. It is going to be a year of celebration! This year, we will have adventures in Ethiopia, Kenya, Malawi, Rwanda, and Uganda. We will join the stories of incredible people overcoming seemingly insurmountable obstacles to improve the lives of those they love. We will experience courage like we have never seen and compassion, juxtaposed by a backdrop of hatred and marginalization, giving it such startling contrast that it will take our breath away. We will find Goliath-like strength in the hearts of children and Phoenix-like fire rising up from the ashes in the voices and visions of women empowered to build a new foundation for their families. And we will experience it all together. We know that the world is full of seemingly helpless and hopeless stories. When we began Blood:Water in 2004, Saturdays were reserved for funerals in many parts of Africa, and still are today. We are too regularly overcome with grief for the children, mothers, fathers, brothers, and sisters who would be alive today if it weren’t for a lack of clean water. We recognize the urgency of the work we do as acutely as ever. Blood:Water was founded on the principle that not everyone needs to take part in the work of ending the clean water crisis. But rather, that by crossing paths with Blood:Water, people would be compelled to find the story that gives them the best opportunity to live out of their own abundance. We do not simply mean the abundance of financial resources, but also abundance of creativity, talent, community, network, education, influence, and family. What can we leverage in order to make the world a better place for all? Blood:Water exists so that people in Africa may have the opportunity to live healthy, abundant lives. This year we will do our best to create opportunities for you to join us. What passion can you offer so that others may live life abundantly? We hope that we can help you answer that question this year and for years to come. Welcome to The Year of Living Generously! There is a spot in Maygenet Tabia, Ethiopia, where four roads stretch in different directions toward villages, each about a 3-hour walk from the crossroads. If you were looking for the local water expert, Simur Yihdego, this crossroads would be a good place to find him. There are few days when Simur, tears in his eyes and passion in his heart, is not found walking between these four roads. Today we walk with him, and with every step, he reminds us that water never weighs the same twice. Just as it takes the shape of the container it inhabits, it also takes on the weight of the people it could save. In his mid-twenties, after studying irrigation, drainage, and water maintenance, Simur was assigned to the people living in the four villages and, in his words, “the weight of the responsibility for this community’s burdens.” He says that one day he transformed from simply being a worker assigned to a region to becoming a resident sharing in the challenges and triumphs amidst his brothers and sisters. Our time with Simur finishes with a visit to Adigogon Kushet, one of the four villages that he has been attempting to serve. We smile together because Simur and Blood:Water have begun working with our local partner, Drop of Water, on a plan to implement a water point in this village. The tone of our conversation is relieved of its heaviness, and we cannot help but feel grateful to come alongside passionate men like Simur Yihdego so that we can carry some of the weight of water and lighten the burden in places like Maygenet Tabia. For the moment, the burden is hopeful and light. But there is a lot of work to be done, and the water will shift once again to weigh heavily on Simur’s shoulders until everyone in the villages where he lives and serves has clean water. It is our privilege to share this burden. It is the reason Blood:Water exists. 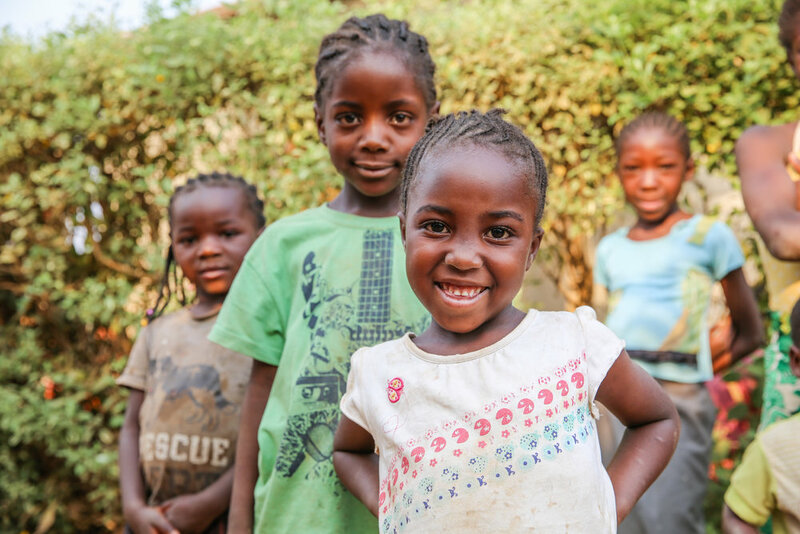 KIDS and clean water are two of the most precious gifts on this planet. For years, Blood:Water has invested in both by providing opportunities for kids in the U.S. to support our partners in Africa through simple actions with great impact. 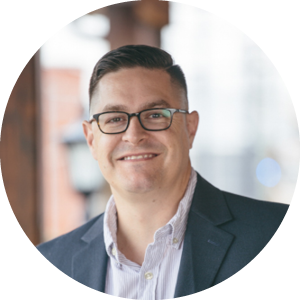 We have seen kids host lemonade stands that raise enough to install a community well and Sunday school classrooms fill a jerry can to the brim with allowance dollars and couch-cushion change. There are few things as heartwarming and powerful as a child on a mission to create change, and it all starts with a conversation. 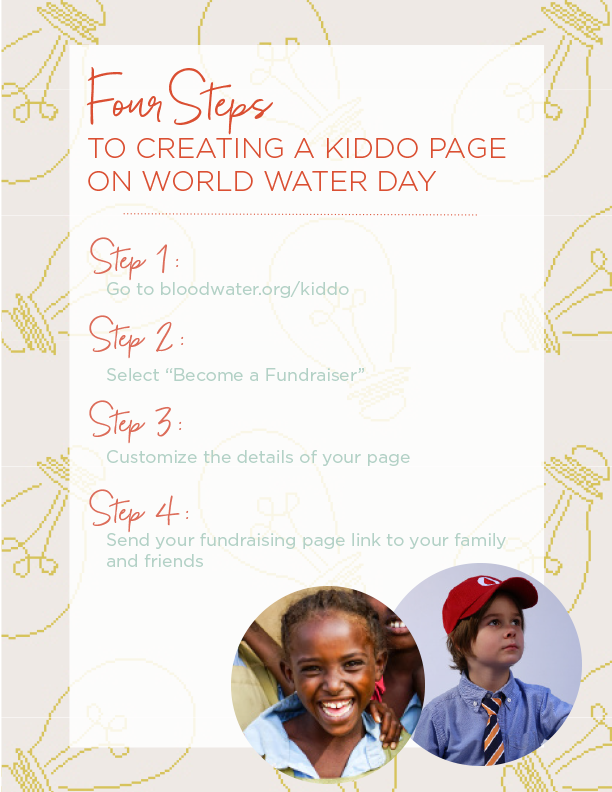 Our new online fundraising platform, KIDDO, encourages kids to use their creative ideas to fundraise $40 for Blood:Water because $40 is all it takes to provide a child in Africa with clean water, sanitation, and hygiene FOR LIFE! KIDDO gives parents, teachers, coaches, church leaders, and family members the opportunity to join together and invest in the lives of kids around the globe—and that’s just the beginning! Because a KIDDO is an entrepreneur for change, we have a business to pair with every participant. When a KIDDO reaches their $40 goal, their assigned business partner will double the impact with a match and TWO kids in Africa will have access to clean water! With your help, participating KIDDOs can create fundraising pages, collect donations and spread the word about their neighborhood bake sale, toy auction, lemonade stand, or in-house piano recital. No matter what your KIDDO enjoys doing, we can turn it into clean water for children in Africa! KIDDO will officially launch on World Water Day and will be a regular part of Blood:Water’s ongoing mission throughout the year to serve communities in Africa. Set a reminder to talk with your kids about clean water and sign up for KIDDO on March 22. Their generation could be the one to end the water crisis in Africa!